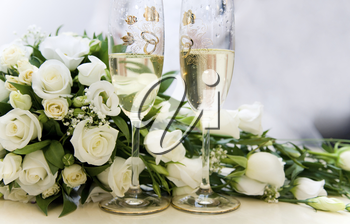 With the approach of Valentine's Day, and it being the time of year for brides to be busily planning their summer nuptials, today's Floral Friday photo is of a beautiful bridal bouquet of white roses beside two champagne flutes. With Valentine's Day just a few short weeks away, it's time to think about romance. As today's photo proves there's nothing like a bouquet of cheerful daisies to bring a smile to a beautiful woman's face. Today's photo is a study in contrasts: a beautiful woman in winter, wrapped in leopard print fur, bare shoulders exposed, holding a lovely delicate pink flower. As a native of the northern hemisphere, everywhere around me all I see is snow. Gardens full of blooming colours are a memory, fading away amid monochromatic winter. Yet, there is no discounting the purity of a world made white. Or for that matter the same absence of colour in a gorgeous flower. 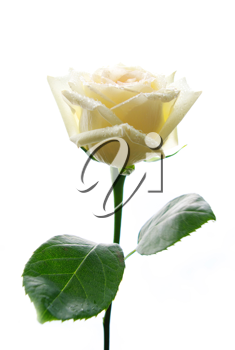 Today for Floral Friday we offer this picture of a single white rose. 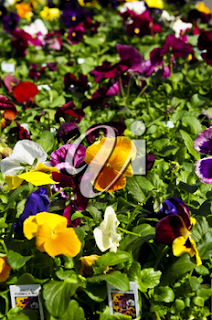 To keep spring in mind on these bitterly cold winter days today's Floral Friday photo is a closeup of assorted pansies ready for planting.